In late March, a French court ordered an investigation into alleged abuses of power by IMF chief Christine Lagarde during her time as a French finance minister and her involvement in the payment of compensation to businessman Bernard Tapie. 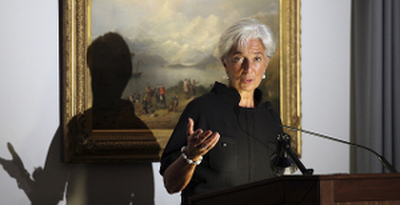 IMF chief Christine Lagarde waived her diplomatic immunity in recent fraud investigation. According to the latest news, Lagarde has been made an assisted witness in the case, meaning she will be called upon to testify but is not directly under suspicion. More interestingly though, at a press briefing in Washington, IMF spokesman Gerry Rice said its executive board, at Lagarde’s request, had waived her privilege as Managing Director to claim diplomatic immunity to the extent necessary to enable her to appear before French authorities in the case. Christine Lagarde’s initiative and request is encouraging and could hopefully persuade other public officials being investigated to follow her lead. In many countries politicians and public officials are granted immunity from penalties, fines or transparency requirements, making it impossible for law enforcers and the public to hold them to account for their action. Immunities appear to render public officials effectively above and beyond the reach of the law. They can be a license to corruption, shielding them from responsibility and accountability. Therefore, it is commendable that Lagarde stepped up and asked for her diplomatic immunity to be waived and that the executive board of the IMF agreed to this request. Unfortunately though, civil society organisations have reported on a range of cases where investigation and prosecution of parliamentarians, ministers and high ranking officials were stymied due to the immunities barrier, often despite solid evidence of malfeasance. For this reason, Transparency International and the UNCAC Coalition, a global network of 350 civil society organisations, have been urging countries that have ratified the UN Convention against Corruption (UNCAC) to impose strict limitations on immunities for public officials. The UNCAC Conference of States Parties (CoSP) might provide more clarity on this issue in Panama in November 2013. The CoSP was established to review implementation and facilitate activities required by the Convention. Since UNCAC’s entry into force in December 2005, four conferences have been held. In November 2009, the third conference adopted a review mechanism for the Convention and also created the Implementation Review Group (IRG) to oversee this review process. The current UNCAC review cycle includes the assessment of domestic immunities such as parliamentary immunity. International immunities, such as diplomatic immunity, remain to be discussed in the UNCAC review context although Conference of States Parties’ Resolution 1/7 called for a discussion on the issues of privileges and immunities related to bribery of officials of public international organisations. A recent letter of the UNCAC Coalition to the Implementation Review Group called for procedures for suspending immunities as well as ensuring that immunities are not used to shield individuals from being held to account for corruption offences. Members of the UNCAC Coalition also raised this issue in some of their statements from the floor at an NGO briefing session attended by government representatives. The briefing session was held at the end of May during the IRG’s mid-year meeting and was organised by the United Nations Office on Drugs and Crime (UNODC) which acts as the Secretariat to the CoSP and promotes the UNCAC and its implementation. If you are interested in this topic and would like to learn more, please read this blog post from SHERPA on immunities and the “Biens Mal Acquis” case.